Following a string of acclaimed singles and live shows, and having firmly established themselves as one of the most exciting bands to emerge on the UK rock scene over the past two years, Devonshire rock-trio Reigning Days are set to release their eagerly anticipated debut Eclipse on 13th April, via Marshall Records. 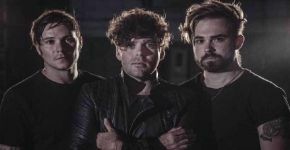 After the success of their 2016 debut self-titled EP, the three-piece have garnered support from the likes of Radio 1, Kerrang and Planet Rock, supported Feeder, Lower Than Atlantis, Enter Shikari and The 1975 and stormed festivals including Download, The Great Escape, Camden Rocks, 2000 Trees and more. The band signed with Marshall Records in 2017 and set to work recording Eclipse at the legendary Abbey Road Studios. The result is a colossal sounding, stadium-sized rock debut, reminiscent of Muse, Royal Blood and Biffy Clyro, which is set to launch the band onto the next level of their career. Eclipse features the acclaimed singles ‘Empire’, ‘Friendly Fire’ and ‘Renegade’, as well as the brand new single ‘Gravity’, which the band released in December. Elsewhere on the album, ‘Chemical’ adds a euphoric dynamic to the record with its harmonic tension while ‘My Sweet Love’ hits hard with thunderous riffs and tons of attitude. ‘Thrones’ showcases the band’s creative ability to deliver huge anthems full of emotion, melodies and power, and ‘Inhaler’ brings punchy beats and guitars before ascending to a colossal climax of frenzied riffs and vocals. Bringing a sense of calm and euphoria to the record is the ballad-like ‘Do You Feel’, before the album closes with the aptly named ‘Sound Of The Future’; a potent prediction for this dynamic trio. Reigning Days finished 2017 on a high with two special album preview shows in London and Exeter, receiving rave responses to the new music and setting up an exciting year ahead for Reigning Days. They have now just announced that they will be lending their support, alongside the Marshall label and brand, to this year’s Independent Venue Week, playing shows across the UK between January 29th to February 4th . Supporting grassroots venues and keeping music live is essential to both the band and label and they are very happy to be a part of this important event.